Gisbert Flüggen came from a family that impoverished during his youth. He worked in a factory in Cologne where he often painted objects. He took painting lessons at the Wallrafianum and allthough his family objected to a career as an artist he was supported by the painter Joseph Weber, who became his friend as well as his teacher. He also attended the art academy in Düsseldorf. After he lived in Flanders for a while he settled in Munich. In 1834 he married Catharina Hölzgen and they had six children. In Munich his work was popular and his studio was mentioned in several tour guides and visited often. Among his pupils were Carl Spitzweg, Anton Seitz, Helisina Girl, Mari Biasini and Hannah Bieber-Böhm. He also educated his son Joseph, who became a painter as well. In 1852 he became a honourary memeber of the Academy of Art in Munich. He suddenly died in 1859 at the age of 48. 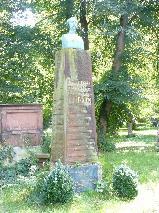 The grave of Gisbert Flüggen at the Alte Südfriedhof, München.